We packed up early at Canyon de Chelly and decided to take a quick tour of the North Rim scenic drive before heading out. 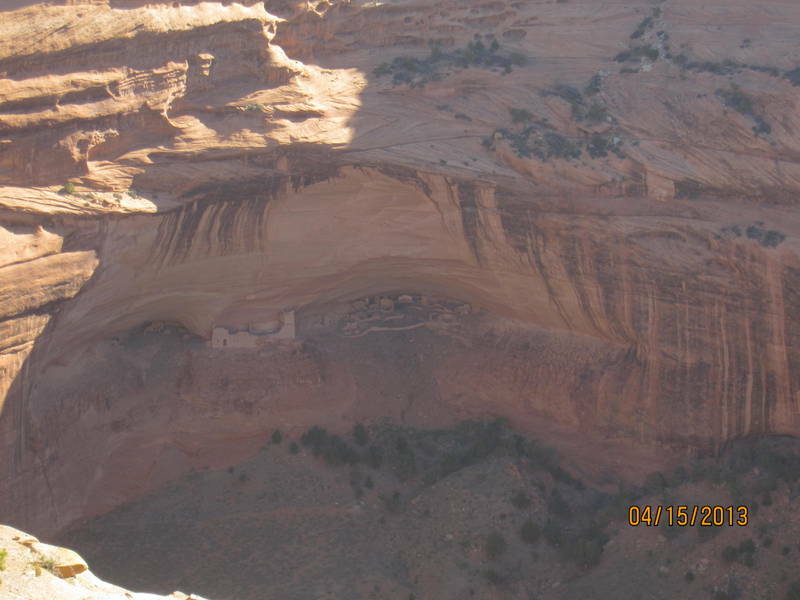 We were able to see Antelope House, the largest of the Canyon de Chelly ruins. crappy photo, wonderful sight of Antelope House, Hard to believe from the photo that this village supported over 150 people. The tall light colored structures were ceremonial, living quarters on the right. Early in the morning, we were the first visitors of the day. It’s spectacular to see, and you can probably find wonderful photos online. With a point & shoot camera and little patience, my photos are a poor representation of the scale of this ruin. It was inhabited from about 1160 to 1300. Here’s a photo I forgot to include yesterday of Spider Rock. Named in honor of the Spider Woman, the goddess who taught the Navahos to weave. It was so beautiful. Sad that this has to be posted. We said farewell to Canyon de Chelly with a rodeo of wild horses alongside the road. I have such mixed feelings about this visit. The ruins are spectacular to see, and the setting is so beautiful. 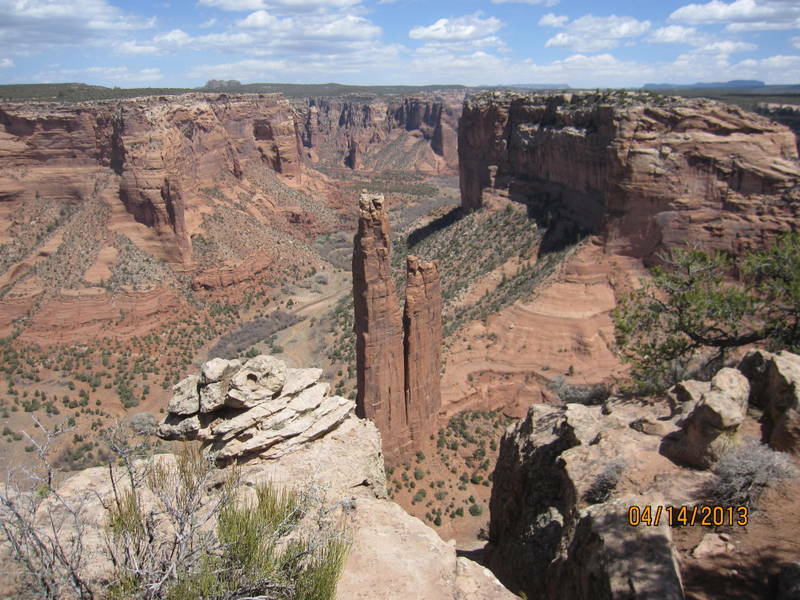 Canyon de Chelly is in the middle of the Navaho Reservation. The general poverty, terrible living conditions, and the apparent lack of opportunity for making a living there are tough to witness. We passed through so many little settlements of ramshackle housing, stuck out on a patch of desert landscape. Blowing dirt and dust devils seem to be the main landscape features in the flats. We saw no industry, no place for anyone to work, with the exception of a few gas stations. There seems to be little agriculture (except in the canyon bottom), and little ranching of note. There are plenty of entrepreneurs selling jewelry and painted rocks, but the customers for this seemed to be non-existent. We were relieved to leave the Reservation, and I’m bothered by my relief. I may leave physically, but I sure will be thinking about this for a long time. We’re happy to be in New Mexico, but worried about the weather. The nighttime temps are forecasted for the 20s, and the wind is relentless. 35-50mph, gusting to 65. John did a masterful job guiding the Fireball along the road, but we were happy to make camp at Bluewater Lake State Park (about 60 miles west of Albuquerque) for the night. We’ve battened down the hatches as best we can for the night, and are planning on moving out tomorrow. Don’t think we can escape this weather though….it’s here for the next few days. We’re going to try to find a place to tuck in out of the wind and just above the freezing line. 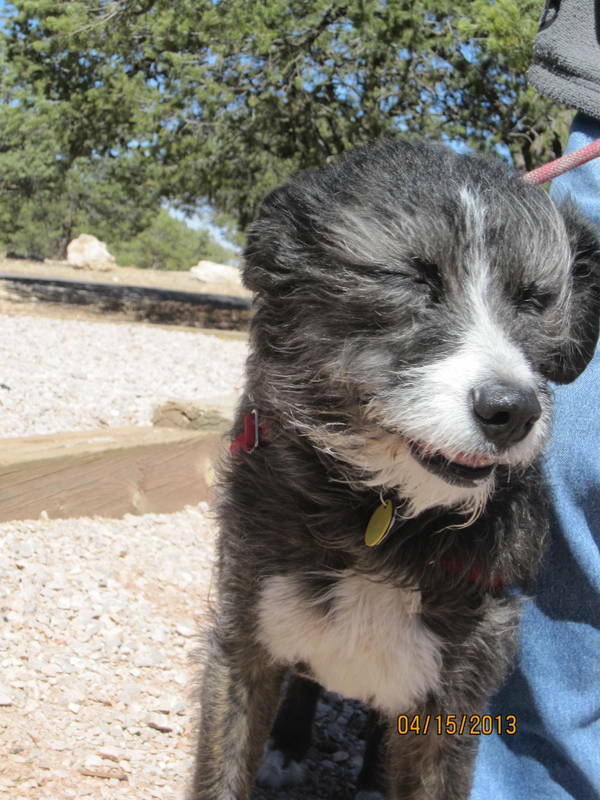 The photo below is the best image of just how windy it actually is here…. Why are you making me sit out here for this photo op? Tailwinds to a cyclist are a good thing, but enough is enough! 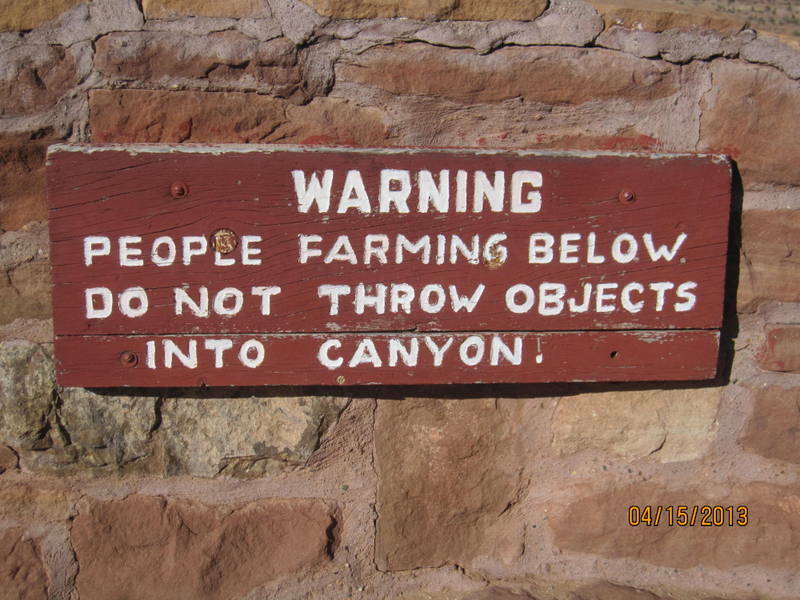 This entry was posted in Arizona, great outdoors, national parks, New Mexico, retirement, RV life, simple camping, T@DA, weather and tagged Arizona, camping, historic sites, national parks, New Mexico, road trip, RV life, simple camping, the great outdoors, weather by Judy Crankshaw. Bookmark the permalink. The canyon looks amazing, I had never heard of it before. It is amazing. You can actually get pretty close to one of the ruins on a hike. When we were there, it was very un-crowded, which is always nice.